Dublin won their first All-Ireland title in seven years last weekend. 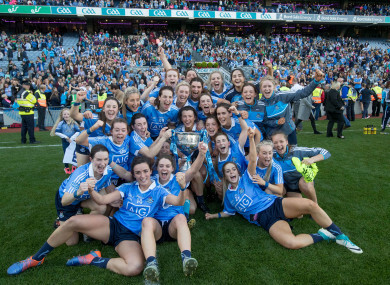 THE ALL-IRELAND winning Dublin ladies team must begin their own fundraising in order to pay for a team holiday later in the year, according to the players. The team made an appearance on RTÉ’s The Ray D’Arcy show on Saturday night, and brought the Brendan Martin cup along with them into the studio. As part of the segment, Fiona Hudson and Niamh McEvoy were interviewed together by D’Arcy. They were also joined by their partners Paul Flynn and Dean Rock, who won a third consecutive All-Ireland title with Dublin earlier this month. Towards the end of the interview, D’Arcy inquired if the teams would be heading off on holiday to mark their respective achievements. The men’s holiday is largely paid for on account of a grant from Croke Park, and Flynn explained that their trip is in ‘planning phase’ at the moment. D’Arcy countered that it ‘doesn’t seem fair’ that the Ladies team should have to finance their own team holiday, considering the record-breaking attendance figures at the game last Sunday. Ladies football is run by the Ladies Gaelic Football Association (LGFA), while the men’s game belongs to the GAA, which is a separate organisation. Email “All-Ireland winning Dublin ladies team must raise funds for team holiday”. Feedback on “All-Ireland winning Dublin ladies team must raise funds for team holiday”.